After visiting Houston, I’ve come to the daunting conclusion that it is impossible to go through everyday actions without touching or using plastic. I’m so much more aware of it now, from the various types of plastics in my Dunkin’ Donuts coffee cup to the plastics in the microfiber cloth I keep in my car to wipe the coffee I inevitably spill when trying to drink hot coffee while driving. Throughout the plastics chain, we live with varying degrees of plastics exposure, with some experiencing different elements of it than others. Because we live in the shale fields, we live with unconventional oil and gas activity in our backyards. The natural gas liquids are then sent to a “cracker” plant to be turned into plastics. At the point of sale, plastics allow processors to ship foods over long distances to be sold (think: salads and sandwiches at Starbucks that were made in Rhode Island instead of in-store). Consumers then purchase products made of or packaged in plastics, sometimes in overwhelming quantities (think: meal-prep delivery services like Blue Apron and low-priced microfiber bedsheets). Plastic is then either recycled, incinerated, or tossed in landfills or the ocean. Even some plastics that consumers think they are recycling end up being burned, contributing more carbon pollution to the air than coal-fired power plants. In the end, our water is either full of plastic bags and bottle caps or microparticles of plastic that were washed into our water systems. Like I said, it’s daunting. This is a monster of a system that has been in place for decades. The task we now face in the Ohio River Valley is to stop another head from growing. The Petrochemical buildout that is planned for this region is designed to support an increase in plastics production and use. At CCJ, we fight it from the source by supporting communities’ efforts to keep unconventional oil and gas activity away from homes and schools while advocating for a just, sustainable future that does not rely on fossil fuels. 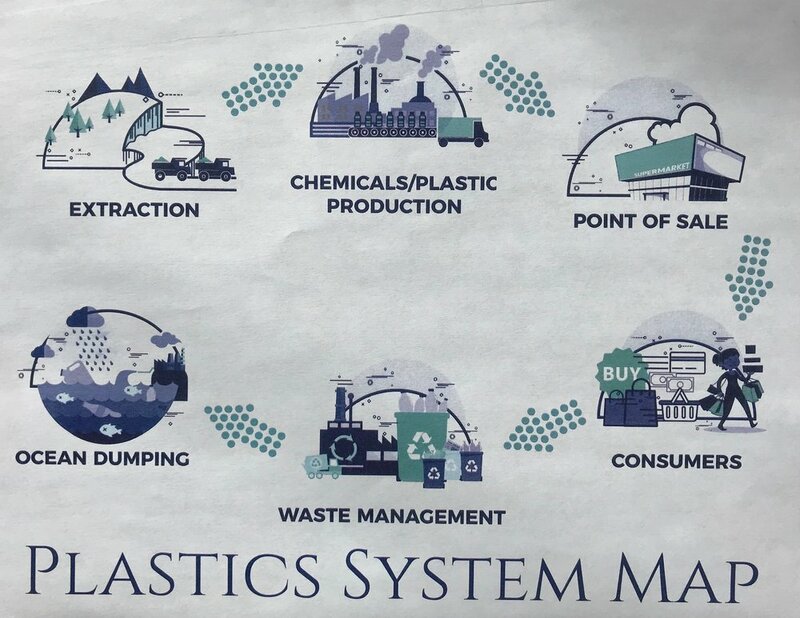 Other groups and organizations like Break Free From Plastic, Upstream, and GAIA work to tackle the problem from other points in the chain. The good news is this: there was consensus among the groups in this meeting that now is a real opportunity to affect change. On a nation-wide scale, people are becoming more aware of the problem, and are interested in learning more about how to tackle it. There are so many small changes you can make to your daily life that would make a difference. There are massive campaigns you can take part in to elevate your voice in favor of a cleaner earth fueled by cleaner energy. To find out more, and to take action, check out Upstream’s website or contact us at the office.